Veteran Edmonton Oilers defenseman Andrej Sekera has missed the entire NHL season thus far following an off-season Achilles tear, but he’s making his way back. Sekera finally returned to action with the AHL’s Bakersfield Condors last week on a conditioning loan and the initial reviews have been overwhelmingly positive, with some believing the 32-year-old looks ready to be dependable NHL defender once again. The Oilers would really like to call him up, but they’re finding that it’s easier said than done. When Sekera takes the ice again for the Condors tonight, it will be the third game of his conditioning stint and in most cases the last. Sportsnet’s Mark Spector reports that Edmonton will file a request to Sekera and his representation that he extend his conditioning assignment for two more games and Spector expects that they will accept. Why? Because right now the Oilers have no way to call him up. Edmonton is currently right up against the salary cap ceiling and even this late in the season can only afford to add $4.27MM in salary to their roster, per CapFriendly. Sekera’s $5.5MM cap hit is thus problematic. The Oilers need to open up close to $1.25MM at the very least to bring Sekera up and there are no good options for demotion among players whose salaries exceed that value. The team is also restricted by their current roster structure; Edmonton is already carrying only 13 forwards compared to eight defensemen. Of the forwards making more than $1.25MM, only Tobias Rieder at $2MM is a trade candidate and his roster spot would need to be filled by another minor league forward which would still not open up much cap space. So what do the Oilers do? Well, the team is known to be shopping goaltender Cam Talbot, whose $4.17MM cap hit is significant. While that drop-off, even offset by the recall of a new backup like Al Montoya ($1.06MM) or Shane Starrett ($818K), would open up enough cap space for Sekera, it wouldn’t open up an additional roster spot and the team would still be forced to put a defenseman on waivers. For that reason, it makes sense that TSN’s Bob McKenzie reports the team is trying to solve this situation by trading away a defenseman. Ironically, the two blue liners named are Brandon Manning and Alex Petrovic, both of whom were acquired by Edmonton earlier this season. Manning at $2.25MM and Petrovic at $1.95MM would both clear enough room for Sekera if traded away for a pick or prospect. However, McKenzie states that there has been little interest in the pair on the trade market. If the Oilers can’t find a taker by the time Sekera completes another two games on his conditioning stint, they will have no choice but to place one or the other on waivers. Should they trade Talbot or Rieder first, the team would likely prefer to either trade or waive Kevin Gravel instead, as his $700K cap hit is no help but his roster spot is. One way or another, the clock is ticking for the Oilers and interim GM Keith Gretzky to figure this out. They are fortunate that Sekera’s camp is willing to extend the conditioning loan, but at most the team has through this weekend. It is hard to imagine a team being in this kind of scenario, the epitome of a cap crunch, but it’s especially tough to see a team below .500 likely being forced to give up assets for pennies on the dollar via trade or for free on waivers to add another inflated contract to their roster. This is yet another mark on Edmonton’s disappointing season. With the season-opening roster deadline fast approaching, many teams will be putting the final touches to their rosters this weekend so another busy day of cuts is expected. We’ll keep tabs on the non-waiver roster cuts here and update this post throughout the day. One major need is for the Oilers to get some help from their young players. Perhaps the most intruiging prospect is Puljujarvi, the team’s fourth-overall pick in 2016. After struggling in his rookie season, Puljujarvi showed some promise last year, scoring 12 goals in 65 games, but the 20-year-old still hasn’t proved that he can be a top-six winger yet. Regardless, the Oilers have resisted trading the prospect as they have received quite a bit of attention from other teams. Yamamoto also struggled in a early-season tryout last season as he played in nine games (tallying just three assists) before being sent back to juniors. However, after scoring 21 goals in 40 games with the WHL’s Spokane Chiefs, the speedy Yamamoto might be ready to claim a spot on Edmonton’s roster this season. The team has many decisions to make with their goaltending next season. All three goaltenders are on one-year deals and will have to prove their value to the franchise for a new contract. Talbot will be the chief goaltender who must prove that last year’s disappointing season was a fluke as the 21-year-old went from a 2.39 GAA in 2016-17 to a dismal 3.02 GAA last year. His .919 save percentage in the 2016-17 season dropped to a .908. So which is he? If Talbot can rebound and show that he’s closer to the 2016-17 season, the team will likely lock him up for several more years, but if not the team may look elsewhere for goaltending help. Another factor could be Koskinen’s presence. Brought over from the KHL, the 30-year-old veteran has been one of the top goalies in the KHL for the past six seasons, but whether he can make the conversion to the NHL is a whole new question. However, a good showing could change the way Edmonton looks at Talbot and his contract in one year. If neither is capable of locking down the No. 1 job, the team should find quite a few interesting names in the free agent market next season. The team does have hopes that they can properly develop the speedy Rieder, who signed a one-year “prove it” deal, which could turn into a two-year deal considering that he’ll still be a restricted free agent next year. The 25-year-old has scored 12 or more goals for four seasons, but has never been able to take his game to another level and now is on his third organization in one year, which suggests that two organizations have given up on him. However, with his speed, he could be the perfect complement to the team’s top speed line. Strome was the key piece in the Jordan Eberle deal last offseason, but while he posted moderate numbers, he hasn’t yet proven that he will be a significant part of the future of the Oilers. The forward’s production continues to decline. The 25-year-old posted 13 goals, the same he did a year ago, but he also played a full season this year, as opposed to just 69 games in 2016-17. However, no one is quite sure what his role will be going forward although the team has two years to figure it out. Is he a top-six winger, who can put up a large number of goals or a bottom-six center? Caggiula has a similar issue. Signed as an undrafted free agent out of the University of North Dakota, Caggiula has improved, posting 13 goals himself last year, but hasn’t been able to provide the breakout season the Oilers are looking for out of their youth. The 24-year-old struggled with consistency throughout the year as he had several significant streaks where he didn’t even register a point and disappeared on the ice, but again, the team has two more years to figure out what it has in him. While many things in 2017-18 didn’t go well, the team saw improved play from Nugent-Hopkins, a phenomenal defensive player, who hasn’t been able to step up offensively much over the last few years. However, the center eventually moved over to the wing on the top line and seemed to find his scoring touch as he tallied 24 goals, matching a career-high. With so much money invested in three centers, the team has made it clear they want to see Nugent-Hopkins play on the wing in hopes of getting some value out of his contract. While at one point, Nugent-Hopkins was a significant trade candidate, it looks like the team intends to hold onto him for the time being. Sekera might be the deal the team will suffer through for the next three years. 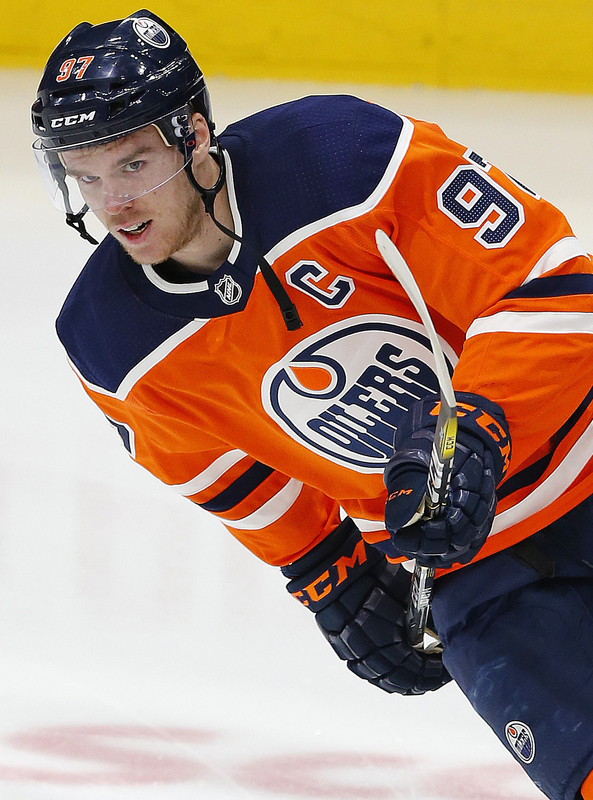 A top defenseman a few years ago, he suffered a significant injury at the end of the 2016-17 and returned to play half a season with Edmonton last year, but was never the same. Then almost two weeks ago, the Oilers announced that Sekera will be out indefinitely after he underwent surgery to repair a torn ACL during a training session. With most, if not all of the 2018-19 season ended, the 32-year-old may have a hard time coming back and establishing himself as a dominant No. 1 defenseman or even a top-four defenseman that he has been in the past. Larsson and Russell have proved to be solid, but hardly spectacular defensemen for the team. Both defensive-minded defensemen, they both didn’t help a struggling blueline enough last season. The team had high expectation for Larsson to develop into a top-four defenseman when they traded Taylor Hall for him a couple of years ago, but he has failed to do that so far. McDavid continues to improve and without a doubt is worth every penny the team will be paying him starting this season. The 21-year-old increased his goal output from 30 goals to 41 as he managed to win the Art Ross Trophy for a second year in a row. He reached 100 points for the second straight year as he tallied 108 points last year and has provided the team with a star player who is perfectly designed for the fast-paced new NHL. Draisaitl, on the other hand, didn’t take that next step after signing an eight-year, $68MM deal last offseason. The 22-year-old was banged up quite a bit in the beginning of the year as he dealt with an eye injury as well as a concussion, but still quietly had a solid season in which he posted 25 goals and 70 points. Hopefully, Draisaitl can take his game up a notch this year to help provide the team with two high-end centers. Lucic’s name appeared in trade rumors throughout the offseason, but with four years remaining on his contract, the team really needs to hope that Lucic can bounce back after a miserable season with the Oilers. The 30-year-old had been a 20-30 goal scorer for most of his career, but the physical winger managed just 10 goals last year in a full 82 games and the team will need him to rebound if the team wants a chance to reach the playoffs next season. Klefbom also had a tough season, but much of that could be attributed to the fact that he suffered a severe shoulder injury in the Western Conference playoffs in the 2016-17 season and he wasn’t the same. He has since corrected the problem this offseason as he underwent surgery to repair the damage and is expected to be fully healthy for training camp. Klefbom came off a 12-goal, 38-point season in 2016-17, but should be able to take his game up a notch, especially after posting a five-goal, 21-point season last year. The Oilers are in a tough position if the team cannot develop their youth. Too many of their players haven’t developed enough and the team can only hope that youngsters like Puljujarvi, Strome and Caggulia can take that next step and at least develop into 20-goal scorers to provide the team with deeper lines and not force McDavid and Draisaitl to do all the work. However, if they fail to develop that talent, then the team will have to find creative ways to lighten their cap load as those bad contracts have at least three or four years left on them, which will handicap a team that is running out of cap space. Sportsnet’s Elliotte Friedman and Bob Stauffer of 630 CHED each have linked the Edmonton Oilers with being the frontrunners to sign KHL goaltender Mikko Koskinen as the team’s backup to starter Cam Talbot. Koskinen, who has been playing with the KHL for the past six seasons, made his intentions known a couple of weeks ago that he’d like to take his talents back to the NHL. The 29-year-old, who was a second-round pick of the New York Islanders in 2009, came overseas and played two games in the ECHL, 41 games in the AHL and four games with the Islanders, but struggled and eventually opted to return to Finland. In 31 games for SKA St. Petersburg, the goaltender posted a 1.89 GAA and a .905 save percentage. Koskinen could be a good fit with Edmonton, assuming Talbot can rebound after a tough season. The starter went from a 2.39 GAA in 2016-17 and dropped to a 3.02 GAA this year. One key factor is the amount of games the veteran has played. Talbot has appeared in 153 games in two years if you include the 2017 playoffs. If Talbot can return to form, Koskinen could be a solid backup option where the team struggled last year. Laurent Brossoit started the year as the backup, but lost his job when he posted a 3.24 GAA. The team then traded for veteran Al Montoya, who didn’t fare much better with a 2.94 GAA in nine appearances. Montoya is the only backup who is under contract for next year at $1.06MM. 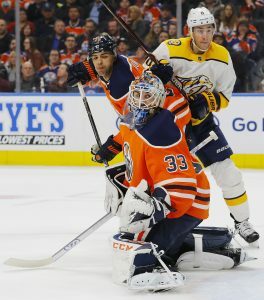 The Edmonton Journal’s David Staples writes that a backup goalie is essential to a team’s success and compares the potential signing to that of Anders Nilsson, who also struggled after being drafted by the Islanders and went overseas before signing with Edmonton. However, Nilsson struggled as a backup as well and was traded away later that same season. However, Koskinen has six years in the KHL under his belt and would be a far more likely option to be successful as a backup with the Oilers. Friedman reported the news on Saturday’s Hockey Night in Canada. The Ottawa Senators have recalled forward Ben Sexton from their AHL affiliate in Belleville, marking the first big-league call-up for the 26-year-old. Sexton was a leader and top scorer as a college player at Clarkson University from 2010 to 2014, but the Boston Bruins, who had drafted him in the seventh round in 2009, moved on after just two disappointing minor league campaigns. Ever since, Sexton has been much more productive in the AHL and has finally earned his first NHL shot in his first season with the Senators after posting 10 goals and 21 points in 28 games so far in 2017-18. Victor Ejdsell is also making his first trip to the NHL, not long after making his North American pro debut. The Chicago Blackhawks have announced Ejdsell’s promotion this morning and the 22-year-old Swedish forward could be in the lineup in short order, seeing as it was an emergency recall. Ejdsell was acquired by Chicago in the Ryan Hartman trade last month and only joined the AHL’s Rockford Ice Hogs last week. Ejdsell recorded 34 points in 50 games in the Swedish Hockey League this season before making the jump and notched an assist in his first AHL game. With backup Al Montoya suffering through a minor ailment, the Edmonton Oilers announced they are recalling Laurent Brossoit on an emergency basis. The 25-year-old goaltender and one-time back-up this year has struggled in the NHL, posting a 3.22 GAA and a .886 save percentage in 13 games this year. He’s fared slightly better with the Bakersfield Condors with a 2.72 and a .912 save percentage in 22 games. The Oilers also announced they have sent forward Brad Malone to Bakersfield. Malone had been recalled Friday, but did not play Saturday. The St. Louis Blues’ Samuel Blais has been up and down quite a bit in the past couple of days. The 21-year-old winger was called up Friday on an emergency basis and sent back down that night. He was recalled Saturday on an emergency basis and was assigned back to the San Antonio Rampage this morning, according to Jim Thomas of the St. Louis Post-Dispatch. He did not play in either Friday’s or Saturday’s games. The Blues have also assigned emergency fill-in Ville Husso to the San Antonio Rampage, according to NHL.com’s Lou Korac. The move suggests that Blues backup Carter Hutton, who has been out with a neck injury since Mar. 3, is ready to return to the team.